For every ten thousand students that join a Tae Kwon Do class, half will drop out the first month. Of that five thousand, half will remain through the second month. Of those remaining students, one thousand will complete six months of training and then quit. Five hundred will study for a year, but only one hundred will see their second anniversary. Three will make First Degree Black Belt, but only one shall go on to teach others what he/she has learned. For Tae Kwon Do is now a part of his/her life and he/she shall go on to share this life with others. Think about it, he/she is one in ten thousand? 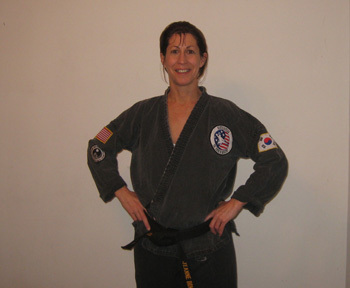 Jeanne M. Donnelly Head Instructor of Makoto-Do, is a 4th Dan Black Belt International Instructor in Tae Kwon Do and has studied many other styles of Martial Arts. She received her Dan ranks from Grand Master Scott Kopperud, president of Unified Tae Kwon Do International. She is an Instructor of Self Defense, Tai Chi, Chi Gong, & Yoga,. Ms. Donnelly is also a Personal Trainer, Master Level Reiki Practitioner and Licensed Mental Health Counselor. She has trained and worked with Crisis Management and Non-Violent Crisis Intervention. Erica Lee Daloia Makoto-Do Instructor, holds a 2nd Dan Black Belt in Tae Kwon Do. (She received her 1st Dan from Grand Master Scott Kopperud.) She has been studying under her mother, Ms. Donnelly, since she was five years old. Erica continues to train in the advanced women’s class and teach in the Girl's Martial Art classes at Ten X Club in Natick. She coordinates their Special Winning Attitude Team, Erica also studies Tai Chi, Qi Gong and Yoga.